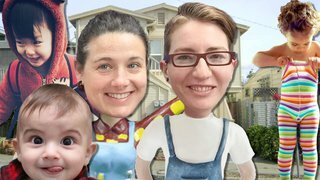 Nicole and Kristan are a queer Bay Area couple who want to adopt a child from foster care. As they prepare to have their home inspected, they child-proof their apartment and invite a couple of kids over to examine their handy work. Will they pass the safety check? Nicole Opperis an Emmy®-nominated filmmaker who directed and produced the feature documentary Off and Running, an Audience Favorite at Tribeca and winner of ten international awards including Best Documentary at Outfest and Best Documentary Screenplay at Silverdocs. The film was nationally broadcast on P.O.V. in 2010. She received a Fulbright Fellowship to direct Visitor’s Day which is supported by New York State Council on the Arts, Chicken & Egg Pictures and The Independent Television Service. She’s also produced films for The Discovery Channel and Here TV, and was selected for Filmmaker Magazine’s annual “25 New Faces of Independent Film”. Nicole has taught filmmaking at Stanford University and San Francisco State University, among other schools. Born in Winter Park, Florida, Kristan Cassady began Suzuki violin in her public school. After graduation from Rutger's University: Mason Gross School of the Arts, she worked as an educator and musician in and around the New York City area. She has played with ensembles including the London Symphony, Manhattan Chamber Orchestra, and Saturday Night Live as well as recorded and toured with such artists as Adele, Kanye West, and Stevie Wonder. Once she met Nicole, her orchestra management skills lead her to film producing beginning with short films, the feature length documentary Visitor's Day, and the web-series, The F Word. Read the full Q&AIn "The F Word | F Is for: Foster Care," Filmmakers Nicole Opper and Kristan Cassady embark on an exciting journey to expand their family. PBS spoke with Kristan and Nicole about the process of adoption from foster care and the lessons they've learned along the way.